GENEVA, Switzerland, August 28, 2015 (ENS) – Two of the world’s most powerful wildlife conservation organizations today strengthened their long-standing collaboration to fight the escalating poaching and illegal trading in elephants, rhinos, great apes and marine turtles in Sub-Saharan Africa, the Caribbean and the Pacific. The Secretariat of the Convention on International Trade in Endangered Species, CITES, a United Nations treaty with 181 government members, and the International Union for Conservation of Nature, IUCN, signed an agreement to beef up their cooperation. In combating illegal wildlife trade, governments are increasingly being confronted by transnational organized criminals, and in some cases rebel militia and rogue elements of the military. The same illegal infrastructure is used for trafficking in drugs, weapons and humans, according to CITES and the IUCN. The illegal trade in wildlife is global in nature and is taking place at an industrial scale, the two organizations warn. An estimated 100,000 elephants have been poached for their ivory from 2011 to 2013 across Africa. In 2014, 1,215 rhinos were killed for their horns in South Africa alone. In 2007 just 13 rhinos were poached. The agreement was signed in the context of the project known as MIKES, which stands for Minimizing the Illegal Killing of Elephants and other Endangered Species. The MIKES project is funded by a 12 million Euro grant from the European Union to the CITES Secretariat. Increasing collective efforts are underway to combat wildlife crime, yet it continues to be a major problem worldwide, estimated by some to be worth up to US$20 billion a year. This ranks it amongst some of the most serious transnational crimes. “This new agreement will reinforce our collaboration, and provide new opportunities to build upon our mutual strengths. It will also bolster the efforts of IUCN’s global membership to address the illegal wildlife trade, and conserve elephants and other threatened species in African, Caribbean and Pacific States,” said Andersen. The new CITES-IUCN agreement will build upon the active participation of elephant range States in the CITES MIKE program over the past 15 years. An enhanced focus will include other CITES-listed flagship species threatened by illegal trade, and extend operations to the Caribbean and Pacific regions. In the future, IUCN will host the MIKES Programme Sub-regional Support Units in Africa and South Asia, which are crucial for providing participating range States with technical assistance to implement MIKES monitoring activities. IUCN will also provide the administrative base for the MIKES technical advisors who will oversee efforts to build the wildlife law enforcement capacity of the eight African focal sites that have been selected to pioneer new measures to minimise poaching. The new CITES MIKES project includes initiatives aimed at strengthening the capacity of wildlife management and law enforcement agencies to combat poaching both within MIKE sites and at the national level. 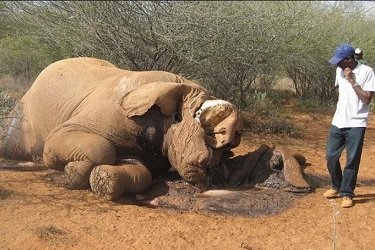 Poaching and the illegal wildlife trade will be among the issues discussed at the IUCN World Conservation Congress scheduled in September 2016 in Hawaii, and the 17th meeting of the Conference of the Parties to CITES, also set to open in September 2016 in Johannesburg, South Africa.